East Aurora, NY | October 30, 2017–Astronics Corporation (NASDAQ: ATRO), a leading provider of advanced technologies for the global aerospace, defense, and semiconductor industries, announced today that its wholly owned subsidiary Astronics Test Systems (ATS) is introducing an expansion of the ATS 5034 System-Level Test (SLT) Platform. Featuring new semi-automatic solutions in a scalable system, the ATS 5034 now offers lower volume, higher mix, small lot, and/or longer test duration options for semiconductor manufacturers. With this introduction, the company now delivers configurations that facilitate the industry’s fastest, easiest development path from single-site to massively parallel system-level test for semiconductor packages of all types. Geneva | March 2, 2017– The Czech Republic’s air navigation service provider has appointed SITAONAIR to deliver a “communication gateway” to its capital’s airport. To discover our Air Traffic Control solutions, click here, or for cockpit solutions, click here. You can find out more about SITAONAIR by visiting www.sitaonair.aero. East Aurora, NY | April 21, 2016– Astronics Corporation (NASDAQ: ATRO) (“Astronics”), a leading supplier of products to the global aerospace, defense, electronics and semiconductor industries, announced today that its wholly-owned subsidiary, Astronics Test Systems (“ATS”), has been awarded a number of follow-on orders from its largest customer valued at approximately $20 million. These orders are for additional production test systems, retooling, services, and support. The orders will mostly be reflected in the second quarter of 2016’s bookings, while revenue will be concentrated in the third quarter of 2016. The expectation of these orders was included in the previously provided range of projected revenue for the Test Systems segment in 2016, which was approximately $93 million to $109 million. Is SANDRA The New ACARS? IFExpress readers: Don’t get cold feet over this bit of aviation communication technology; however, it might help to get started by reviewing today’s aircraft ACARS System. For the last few years, Axel Jahn’s TriaGnoSys has never ceased to amaze us. First it was IFE and then Connectivity, last year it was weather, and now, his company is proposing and testing what we like to consider as the new ACARS… all in association with his “One-Box-Wonder”. If you aren’t a pilot type, ACARS is a digital datalink system for transmission of short, simple, protocol heavy messages between mostly commercial aircraft and ground. 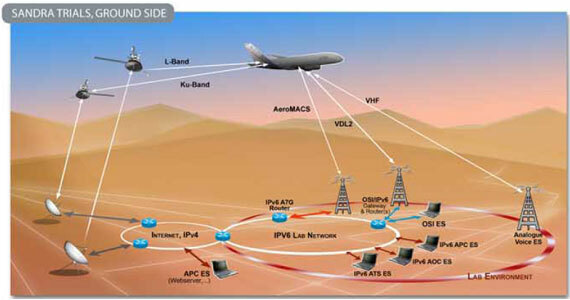 The TriaGnoSys solution, SANDRA (Seamless Aeronautical Networking through integration of Data links, Radios and Antennas), described in their own words as a proof-of-concept testbed of future IPv6-based connectivity, which integrates cockpit communications with both passenger and non-operational airline communications into a common system architecture. Check out their press release. SANDRA is a connectivity approach that uses modern data protocols and if you don’t know about the company, be advised that TriaGnoSys Research and Development focuses on a broad range of mobile communication fields, including mobile end-to-end solutions, wireless In-flight Entertainment (IFE), next generation satellite connectivity and cabin/cockpit communication, as well as combined navigation and communications technologies. The chart on this page may help. Q: If voice is least preferred communication methodology (and we understand why), how is the aircraft/ground info displayed? A: That depends entirely on the avionics system on the aircraft. But it would be displayed in a very similar way to current controller–pilot data link communications (CPDLC) data. Q: What is the range of info requests/updates… weather, fuel, traffic, aircraft status? Q: How is passenger data involved? A: Passenger data is involved inasmuch as the cockpit and cabin will share suitable link capacities, though with strict segregation to provide security. Q: Who pays what and when and how? A: That is really a question to address when we get to the implementation stage. However, it is likely to be a combination of the airline, for the cockpit side, and the passenger for the cabin side. 5. What is the present-day total coverage? A: Coverage of all flight routes is one of the key aims of SANDRA, which is why the technology uses both both satellite and ground radio links. Q: And finally, why is this coming to aircraft now? A: There is “a common agreement” that the current practice of voice-centric ATC and limited bandwidth cockpit data links will limit future air traffic growth. In response to that, SESAR and NextGen are specifying the future data-centric concept of operations, with future data links as a central element (LDACS, AeroMACS, Iris). ICAO has already set the framework for the next generation global Aeronautical Telecommunication Network (ATN) based on IPv6 in the ATN/IPS SARPS Doc. 9896, specifying minimum communication protocols and services required for the implementation of the future ICAO ATN. This is the background for SANDRA and why this projects brings IPv6 data links onto an aircraft. Q: BTW, is this loosely considered airborne data integration? A: Yes, basically that is exactly what it is. Q: We gather this is not a “replacement” for ACARS, then? A: SANDRA is not a replacement of ACARS. In fact, it was originally designed to transmit ACARS messages over SANDRA. So ACARS applications may run over the new links in the transitional phase, possibly being replaced by new protocols. SANDRA is more about the seamless integration of the communications technology than the details of the services that run over the communications.